You get dissappointed when you learn that you have to give up your favorite – chicken, on a plant based diet. But technically you dont have to miss your chicken with this dish. Joanne Dunn from our GOH group brought this dish to one of our potlucks, where everyone was happy for not missing the chicken. Soak the Soy curls for about 10 minutes in warm water. Once they’re ready, use your hands to squeeze out as much water as you can. Set aside. Cook the potato for about 10 minutes or until tender. Cook the fettuccine according to the instructions on the package. Cook the mushrooms, sweet peppers, onions for about 3-4 minutes and set aside. Sauté the onion and garlic for about 3 minutes. Put in a blender with the rest of the ingredients -cashews, lemon juice, unsweetened almond milk, mustard, Salt, Black pepper and process until smooth. In a bowl mix the seasoning for Soy curls – soy sauce, liquid smoke, paprika powder, onion and garlic powder, salt and black pepper. Pour the mixture over Soy curls and mix well. Pan fry the seasoned soy curls for about 5 minutes until it becomes crispy and golden. 5. 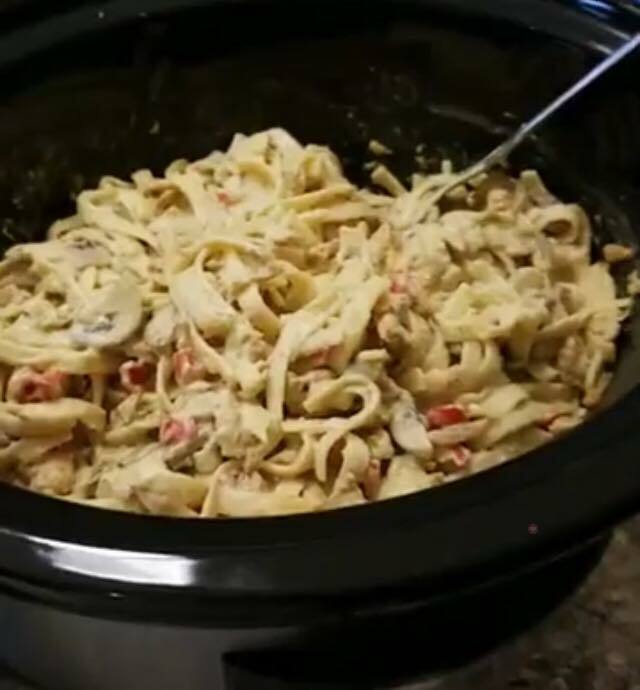 Put the blended alfredo sauce in a large pan and cook for a minute until it becomes creamy and thick. Add the pasta, cooked mushrooms, peppers, onion and the chikin. Sprinkle with fresh parsley and black pepper and serve with lemon slices.